It's a bit surprising that a band formed by former Dimmu Borgir drummer Tjodalv and Satyricon guitarist Cyrus has little or no black metal leanings. Instead it’s very much a classic thrash sound with some interesting compositional choices that add a dark, moody flavor to what could otherwise be easily written off as Metallica/Testament worship based on the pure thrash parts. A perfect example of those choices working is “Release,” one of the strongest tracks here. It opens with a nice driving bass line and dark verse that leads to a melodic chorus that puts me in mind of Sentenced. It’s the first time the band really treads into that territory on the record which through the first four songs very much stayed in the thrash realm. They revisit the sound frequently in the last half of the album with doomy choruses reminiscent of Sentenced or Paradise Lost. “Under” is another great example opening with an almost-commercial clean, bouncy guitar lick leading into a nicely flowing, catchy song, even if it’s probably the least heavy on the record. I could really hear this being a breakout kind of song for the band. That's not to say that the straight thrash stuff is weak. Quite the contrary. Album opener “More” and “Brother,” which features a nice screaming chorus that reminds me of early Sepultura, are solid thrashers that put a modern spin on a classic sound. Susperia gets something that a lot of the new breed of thrash bands don’t, and that’s that even though you play the same kind of music as other bands, you have to have your own unique character and sound. So while a song like “The Clone” reminds the listener of Testament, it doesn’t sound like a band trying to copy Testament. Still, it’s the doomy stuff that really works for the band and gives vocalist Athera a chance to show the versatility of his voice, from deathish growls to thrash barks to more melodic bits. Those are the songs that are really going to stick in your head and make you want to return to the record. 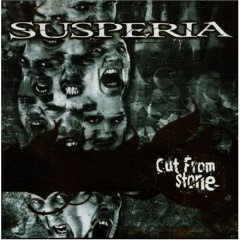 Though Susperia caught my attention with their last record, Unlimited, Cut From Stone is really the first Susperia record that I’ve spent any quality time with. I may have to go back and dig into the catalog a bit.